A Reuben sandwich recipe isn’t complete without brined pastrami or corned beef sandwiched between slices or rye bread, melted Swiss cheese, sour kraut & thousand island dressing. This copycat Reuben sandwich recipe was recreated from the little diner called Little George’s Restaurant. And if you didn’t know, they happen to make delicious HOT Reubens, ozzing out with thousand island and seared on both sides–just yum!! After analyzing how the Reuben sandwich was being made, there (they actually have an open faced stove where the cooking takes place) I was able to get an idea of how it’s done. Although Little George’s uses pastrami, corned beef could also be used in place of pastrami. The difference between the two is the making method and ingredients used to season the meat. Pastrami (also usually beef) is brined and corned beef is cured. Both are prepared differently but are similar so either one could be used. This recipe has been adapted from the diner version and heating the sour kraut and pastrami before assembling the sandwiches helps the inside of the sandwich stay HOT. 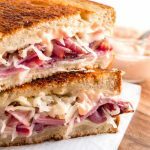 Make this with quick homemade thousand island dressing (with ingredients you may already have on hand) and let me know if this Reuben sandwich recipe is a keeper! 1. Heat skillet over medium heat. Meanwhile dollop 1 TBSP of thousand island dressing onto each slice of bread and top with a slice of swiss cheese. 2. Place sour kraut onto pan and heat through (about 1 minute.) Remove and heat pastrami on both sides until hot (about 20 seconds each side.) Place aside and wipe clean the pan. 3. Assemble sandwiches by placing 1 tbsp of hot sour kraut onto one slice and 3 slices of pastrami onto the other slice of bread. Join together to make a sandwich and butter outside of the slices (or just spray or grease pan.) Place sandwich into preheated skillet and fry 2-3 minutes on each side until cheese melts and bread browns. A Reuben sandwich recipe isn't complete without brined pastrami or corned beef sandwiched between slices or rye bread, melted swiss cheese, sour kraut & thousand island dressing. This copycat Reuben sandwich recipe was recreated from the little diner called Little George's Restaurant. Heat skillet over medium heat. Meanwhile dollop 1 TBSP of thousand island dressing onto each slice of bread and top with a slice of swiss cheese. Place sour kraut onto pan and heat through (about 1 minute.) Remove and heat pastrami on both sides until hot (about 20 seconds each side.) Place aside and wipe clean the pan. Assemble sandwiches by placing 1 tbsp of hot sour kraut onto one slice and 3 slices of pastrami onto the other slice of bread. Join together to make a sandwich and butter outside of the slices (or just spray or grease pan.) Place sandwich into preheated skillet and fry 2-3 minutes on each side until cheese melts and bread browns.